Jin Xuan Oolong Tea is hand-plucked from a farm located on the famous Ali Shan (Ali Mountain) in central Taiwan. Jin Xuan Tea was introduced to the market by the Taiwan Research and Experiment Station (TRES) in 1981. 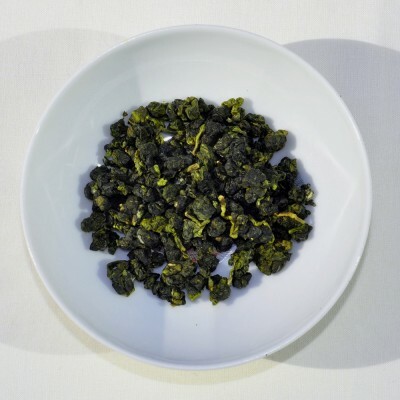 The upper altitude limit for growing Ali Shan Jin Xuan Oolong Tea is 1600m above sea level, but this particular Jin Xuan tea is grown at 1200 metres, procuring its famous ‘milky fragrance’ with a rounded, soft sweetness touched with a light creaminess. Curiously, the main leaf vein almost forms a right angle to the the other branch leaf veins. The name Jin Xuan refers to a specific tea varietal developed by TRES dedicated to the improvement of the tea industry of Taiwan. Jin Xuan teas are satisfying teas to drink as they offer mild floral notes, with a sweetness that hints at exotic fruit. This Alishan Jin Xuan is a very good example of how this strand has contributed to the characteristic high mountain oolong taste, with typical green, crisp, pastoral notes tinged with the scent of mountain flowers that charm the nose. The palate will immediately be pleased by the creamy texture and taste which embody all of the characteristic qualities for which Taiwanese high mountain teas, are famous.